One may think that the Cold War meant a complete communication break-down between the East and the West. However, things during Communism were never just black or white. Relationships between the two “Blocs” were mainly influenced by the balance of power on each side, and by the opportunities of the moment. To safeguard their strategic interests, the United States of America often embraced diplomatic relationships with dictatorships that would otherwise be incompatible with the democratic values they are typically preaching. Such was the case with Romania, which was led at the moment by the Ceausescu couple. And so was the case later, when the American government became close friends with the Saddam regime in Iraq, or backed up the Afghan Talibans led by Osama bin Laden in the war against the Soviets. From this moment on, it was pretty clear to the Western Bloc that the Soviet Union finally had a contender from within. Yugoslavia’s President Josip Broz Tito followed the same path as Ceausescu, declaring his country independent from any Soviet influence. 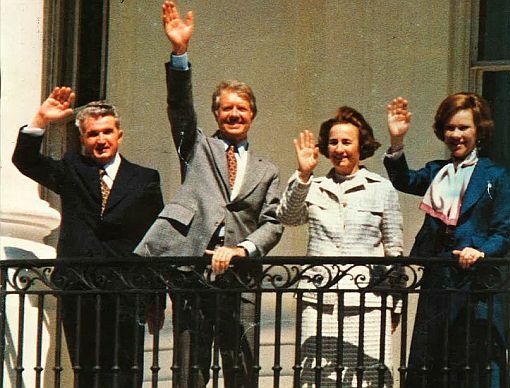 As a result, Ceausescu managed to maintain close relationships with both the East and the West during his regime. Romania was one of the few Communist countries (alongside China and Yugoslavia) which took part in the Summer Olympics of 1984 organized in Los Angeles. 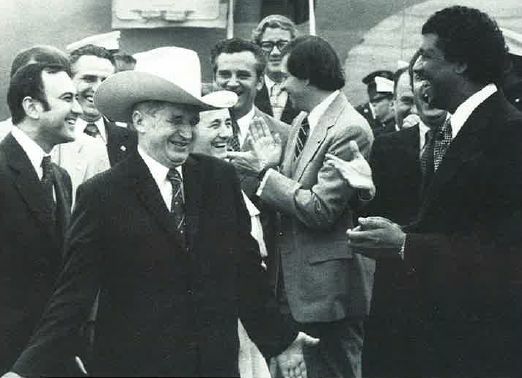 People from Ceausescu’s entourage believed that he secretly envied America for its modernity and the high standard of living, and that he always enjoyed himself when visiting the country. He did so on four different occasions. It’s also of great benefit to me as President to have a chance to consult with a national and an international leader like our guest today. Their influence as Romanian leaders throughout the international world is exceptional. Because of the strong commitments of the President and the independence of the people, Romania has been able to serve as a bridge among nations with highly divergent views and interests and among leaders who would find it difficult under some circumstances to negotiate directly with each other. 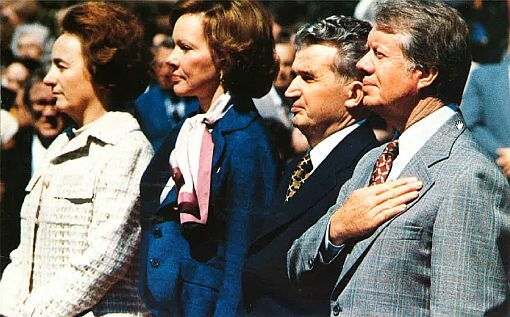 One recent notable achievement of President Ceausescu was to be instrumental in arranging the historic visit of President Sadat of Egypt to the capital of Israel in Jerusalem. Both of those countries have found in Romania an avenue of communication and understanding that’s been very valuable to them, to the Middle East, and to world peace. There are differences, obviously, between the United States and Romania, in our political system and also in our military alliances. But the factors which bind us together are much more profound and of much greater benefit to our countries. We share common beliefs. We believe in strong national sovereignty. We believe in preserving the independence of our nations and also of our people. We believe in the importance of honoring territorial integrity throughout the world. We believe in equality among nations in bilateral dealings, one with another, and also in international councils. We believe in the right of every country to be free from interference in its own internal affairs by another country. And we believe that world peace can come—which we both devoutly hope to see—through mutual respect, even among those who have some differences between us. Our goals are also the same, to have a just system of economics and politics, to let the people of the world share in growth, in peace, in personal freedom, and in the benefits to be derived from the proper utilization of natural resources. We believe in enhancing human rights. We believe that we should enhance, as independent nations, the freedom of our own people. And Romania has been instrumental in pursuing the goals of the Helsinki conference, in particular, building the mutual confidence factors that can let the nations of Eastern Europe and the nations of Western Europe understand one another better and build up legitimate trust through that understanding. 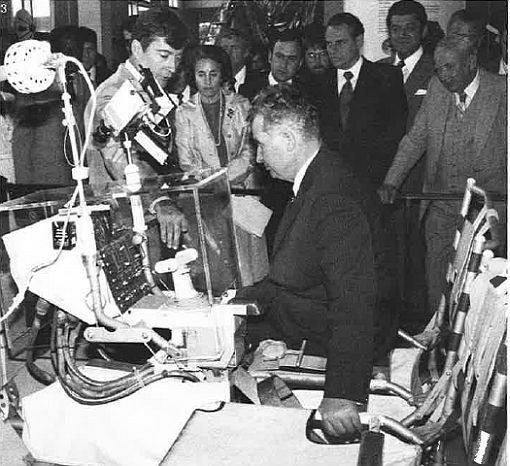 Ceausescu’s itinerary in the United States often included visits to local businesses, research or academic institutions. Below is a photo of him visiting the Lyndon B. Johnson Space Center in Houston, where he is guiding a Moon exploration vehicle with the help of astronaut John Young. This entry was posted in Uncategorized and tagged America, dictator, Espionage, Jimmy Carter, Nicolae Ceausescu, Pacepa, USA.